Beyond the black are first up. They're a German female fronted metal band who get the night off to a very good start. I haven't listened to the band before, but with their debut album due out in the next few days I'll certainly be getting a copy as they impressed me tonight. Singer Jennifer Haben has a great voice and the band are great too. I can see Beyond the black appealing to fans of Within Temptation. For me, the only part of their set I thought didn't work was the very long piano intro to the second song - it's something that would work well on an album but doesn't work so well in a live show particularly when they have a short set. A great set to start the night. Hell were next up, and took to the stage in front of a big crowd - by now the venue was packed. I've seen the band several times and they've never disappointed, and tonight was to be no different. 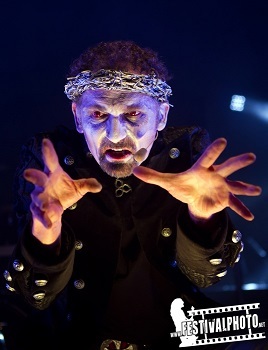 They have a distinctive image with their outfits and makeup, and frontman David Bower puts in a very theatrical performance that really helps make Hell stand out from almost any other band around. He's like a demented priest delivering a fiery sermon as he sings, and at one point in the set he leaps down from the stage to lay hands upon some of the sinners in the crowd. It's a captivating performance whether he's singing or flogging himself, and while all this is happening the rest of the band are putting in great performances too. Hell are a band who are always worth a trip to see as they never disappoint. A great set. 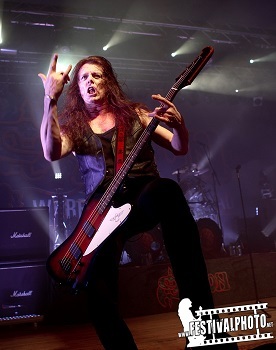 Finally it was time for Saxon. After so many years the band have a huge back catalogue filled with great songs to pick from when choosing the setlist, but for this tour they've chosen to focus on songs from "Wheels fo steel", "Strong arm of the law" and "Denim and leather". Tonight is one of the handful of dates that had to be rescheduled from December due to the illness of drummer Nigel Glockler. As he's still recovering his place on these dates is taken by U.D.O drummer, Sven Dirkschneider (son of German metal legend Udo Dirkschneider). Saxon have been doing this for so long that they make it look easy, but there's no feeling that this is just another day at the office for them - they still put everything into it and give us a great performance in a show filled with great songs. Early on in the set we get the title track of the latest album Sacrifice (which being two years old must mean we're due for a new album before too long), but it's those three albums from 1980 and 1981 that dominate the set tonight along with a selection of other songs from their career. The crowd that filled the venue certainly loved it. I'm guessing it was a sold out show judging by how crowded it was in their - even after all these years Saxon can still draw a big crowd. Saxon are always a pleasure to watch as they have such a strong catalogue of classic heavy metal songs that not many bands can rival. For the encore, what better way to end a show based around three albums than to play the title tracks of each of these albums - which just happen to be three fantastic songs that are firm fan favourites. A great end to a great night.